When the topic home improvements comes up, we usually think of large, grand projects that will make a very visual impact on our homes. You should consider a smaller project that is more for your own happiness than for your guests’ eyes. A breakfast nook is the perfect addition for you and your home. A breakfast nook is a small area just off of the kitchen primarily used for eating small meals. Perfect for breakfast, lunch, or a snack, a nook is cozy and just big enough for two (or perhaps three) people. A breakfast nook does not replace the dining area, but complements it. A dining room is made for several people and usually has room for several more. This large amount of space makes dining for two people quite awkward. 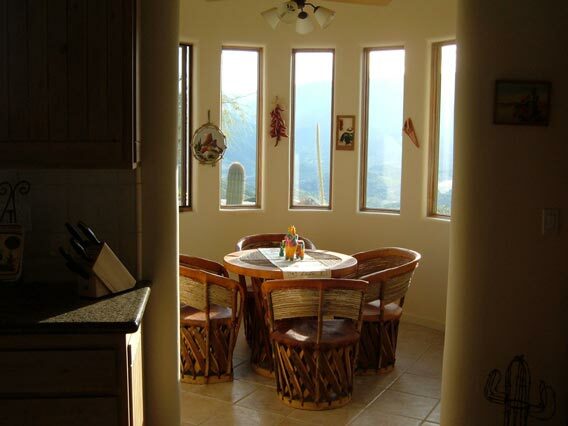 Your breakfast nook cuts the space down to perfection for you and your spouse. Some homeowners prefer an addition to their homes for a breakfast nook, but you are much better off making your nook from the space available in your home. A nook, at its most basic, requires only part of a wall and a small table (or even just a shelf). The possibilities expand from that simple design to almost anything you can imagine. You can even start with the idea for a nook and gradually expand it into a separate, small dining room. One other benefit of a breakfast nook is that invites (almost requires) its own table service. Remember that lovely, quaint service you spotted last year? It will be perfect for your breakfast nook. When making your nook from available space, you might think that you will be losing other space on a one to one basis. This is not necessarily true. A breakfast nook will often have large amounts of storage (cabinets, shelves) for its size. In fact, a nook can almost double the apparent size of the area. A breakfast nook provides a cozy, romantic area for your home without the need for expensive construction. You owe it to yourself to turn a small piece of your home into a grown-ups only area. You will treasure the intimate mornings in the nook of your Duck oceanfront home! Good contain and nice photo for your kitchen.